This dish is made to take a familiar item and manipulate it into different texture than normal. Amaretti cookies are made from almond paste and come out with a nice soft pillow like texture, here they are steeped into cream and made into a panna cotta and pureed with egg white, flour, and liquid glucose and baked into a tuile sprinkled with fennel pollen and maldon sea salt. The acidity from the apricots brightens the dish and is accented by the anise flavors of fennel pollen and tarragon. The zabione is apricot jus and tarragon whipped up with versawhip and xantham gum. The flavors of the dish are solid and rich but not overpowering. There is a third dish that I will post later. I had been wanting to make kimchi for the soup of the day at work for some time now and when I saw how much baby bok choy we had in the walk in I decided to go for it. I served most of these ingredients on the plate as the soup garnish but decided to make a plate as if it were my restaurant. The very first customer we had tonight was korean of course, and she ordered the soup. I was not worried about the flavor because I knew it was tasty, but I knew that it was not as spicy as she wanted. And that is what she told the server, it tasted great but ot spicy enough for her. And to show the smooth texture of the carrot tube is as smooth as a puree here is a pic. I have been working on the almost 100 percent meat noodles for several weeks now. These can be served cold or hot with no side affects. They are almost what I want but they can only be bent to 9o degrees with a lot of care. Here they are shown with sweet carrot puree and asiago cheese. This is a dish that I have been wanting to make for a while. I have had a version of this written down, but I have not had time to make it until now. I served a smaller version of this for the dessert amuse and the guests, all of the staff, and I were really shocked by the flavor combination. It was completely devoured by everyone. The micro green garnish is basil cinnamon and the cornbread is seasoned with cinnamon and cumin. The tuile on top is bacon caramel and cocoa nibs. On Sunday we did a James Beard Foundation benefit dinner, my chef invited all of the other chefs that were nominated for the Midwest division last year for Best Chef Midwest. The other cooks and I were asked to make a dish for the after party upstairs. I took it as an oppurtunity to impress some great chefs. The octopus was poached in a stock made with lemongrass, ginger, cardamom, clove, tangerine, lime, lemon, and mirepoix. I really let the flavor of the octopus be slightly softened and highlighted with the flavors of the broth. The whole thing was poached at 107F sv for about 45 min. then cooled and brushed with olive oil, lemon juice, and fleur de sel. Tonight we had a reservation that said ovo lacto vegetarian. Which I guess means maybe fish or some egg, but no lacto or meat. About 40 minutes before they were gonna sit I mentioned it to my sous chef and he told me if I wanted to I should whip something up. I tell you what to make something that does not look or taste like a “normal” salad and not use lactose, meat, (I wanted to prepare for only vegetarian, and in fact they were pretty much vegan) or BUTTER! is kind of difficult on the fly. We had a lot of beautiful citrus in the walk in today and the next thing that I saw was beets. I thought I cant go wrong now. I poached the beets sv in OJ. The dots on the plate are cranberry and beet puree (awesome), on all of the larger circles of beet are tangerines soaked in anise seed simple syrup, on the smaller circles are just clementines, and the whole plate is covered with micro citrus and cinnamon basil. To finish there is some olive oil foam across the plate. We did a lot of parties last week that used butternut dice for the salad. We only us the tops of the squash so we can get a nicely shaped cut, so this means that we had about 30 lbs. of bnsq bottoms. We peeled them and de-seeded them and cryo so the wouldnt rot. Yesterday my Pastry Chef and I got together and wanted to make ice cream from the bnsq. He told me to go ahead and make the dessert amuse with it, and therfore this is the pic of an enlarged amuse. In the cake there is a little white truffle oil and several types of coconut (milk, fat, sweetened). I cooked it and since there was so much fat that is really took on a nice sear after slicing and did not dry out at all. The opposite almonds are; a light caramel toffee with fleur de sel and raw almonds, and the almonds on the plate and under the ice cream is dark caramel (could have been darker), roasted almond slices and smoked lava salt. To tie the dark richness of the ice cream and cake with the toffee was the strongly flavored molasses and soy gastrique. I have always loved doing twists on classic dishes (as you know if you frequent this blog) and my sous chef said he was gonna make a batch of beef stock from all of the scrap leftover from the parties last week. He mentioned a that I should make a French Onion Soup. This is the pic of the Carmalized “Funyun”. It is an onion cracklin that is coated with caramalized onion powder, salt, sugar, and cayanne pepper. It was served on the side and was meant to be eaten like bread with the soup. Under the “Blanket” of gruyere there is a dumpling made of roasted shallot and garlic puree that is steamed then deep fried. On top is dehydrated gruyere and on the side of the bowl is brown butter toast puree that was gratineed. The French Onion Consomme was still very dark when served tableside and it had an awesome deep beef, herb, and onion flavor. When all components were eaten together everyone in the kitchen and the guests that ate it said it tasted just like a really good French Onion Soup. Oh Yeah and I forgot to mention that on Saturday afternoon my phone rang and it was chef Grant Achatz himself. I got the job!! I will be working at Alinea within the month. I made this dessert amuse several months ago and never posted it. I really loved the flavors and have made several dishes off of what I discovered from these flavor combinations. My chef asked all of the cooks to make an ice cream and this is what I came up with. All I remember is that one table of four guests were in complete awe of the flavors and told the server to tell the pastrychef (me) that it was an incredible combination. This is the dessert amuse that I made tonight. All of the flavors were really amazing together. The panna cotta was an awesome texture, so creamy, so tasty. The time was really an perfect finsih to the strong flavors. One thing that I want to talk about is that the foam was so much better than this picture shows but for only 10 seconds. The lecithin that I was using is over a year old and is definetly not good any more. Alright I know that is pushing it a little. 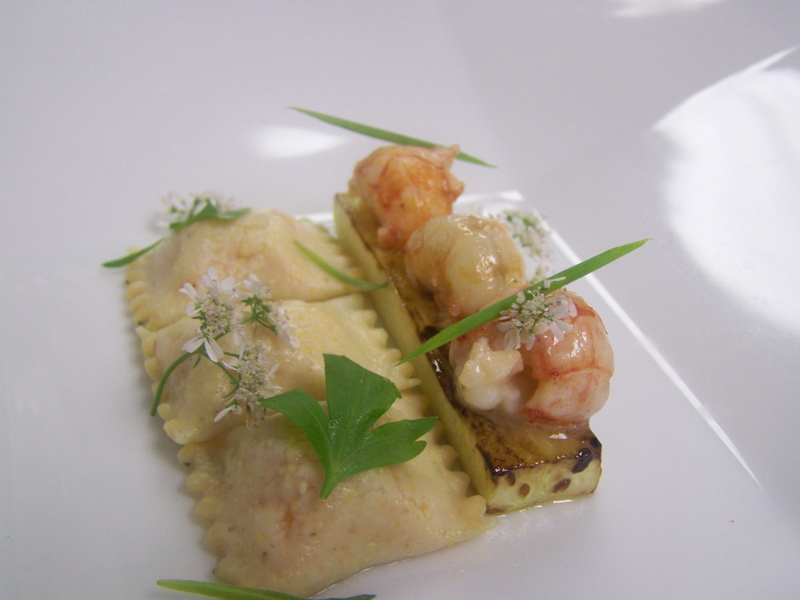 Again this is another larger version of the amuse that I made tonight. The scallops were sliced thin around a sausage of shrimp, chinese five spice, and paprika. The paprika worked with the 5 spice well and added a little smokyness. The beet sauce added sweetness and acid that cut the rich foam of coconut-squash and worked with the bitter greens to a fresh finish. Well all I got to say about this that has not been said above is this ummm??? Look at this picture below. Today I was an extra instead of the tournant where I usually work everyones station on their day off no one had a day off because of the holiday. I ended up making three specials. The soup of the day. A vegetarian entree and, a v.i.p. appetizer. The middle endive is filled with the half raw half cooked puree with tarragon and the other two are filled with the same puree and black truffle oil. I was already making raviolis for the regular menu and I was told to make a v.i.p. appetizer of whatever I wanted but they needed it in 10 minutes. Not too bad for 10 minutes. With all of the consommes that I have made I probably could make a page on my blog (which I need to update) but, if there is going to be a broth it better be perfectly clear. After Thanksgiving I saw my aunt making making a ham and bean soup and I thought given the season I should do my version of the dish. I have been thinking really hard about chadzilla’s combination for the eighth TGRWT of white chocolate and caviar. Since this combination was made famous from Chef Heston at the Fat Duck I immediatly thought of another very famous dish if not the most famous dish in the world Thomas Kellers “Oyster and Pearls”. I wanted to do a twist of it with oyster mushrooms or chicken oyster but, in my head I could not make to combination of oyster mushrooms or chicken oysters with the combination of white chocolate. Previously I found the flavor medley of white chocolate and asiago and I rolled with it. I poached the leek wrapped shrimp in parmasean broth SV at 115F I know that technically I could go lower of shrimp but I dont think that it is necessary. I have done it at 107F but they got cold pretty quickly. The textures of fennel are fennel puree, shaved fennel and fennel seed and pumpkin tuile. This dish just came to me about a week ago, I could not sleep because my mind was running and I wrote somthing in my computer. In the morning I opened my computer and read pretty much what you see here. I really love the texture that the banana gave the sorbet and the combination of the salt and parsley with and the hint of spice in the throat that is quickly tamed by the smooth sorbet. We got some awesome local grown butternut squash in the other day and I looked at them today and said “hello my old friend, long time no see”. I slow roasted the squash at 320F and pureed it with chix stock and a touch of cream. I wanted to make butternut squash gnocchi but I knew that it would be very difficult to pull off and since the menu would be set for the night I did not want to have a failure and have to face my chef. So I started with butternut squash puree, potato puree, an egg and some flour. I let the mixture go in the Hobart with just a touch of flour and began to make some gluten. I poached the dumplings in hot water, they tasted very squashy and great but the shape as you can see here was not so hot. I got to thinking and I piped the mix in some molds and steamed them until cooked. Cooled them down then popped them out and fried them. Perfect, nice light crunch on the outside and a smooth interior. I have a lot of ideas now how using this technique and next time there will be no flour just powder gluten. I dont know why but my mind has been turning to desserts lately. I do really love warm banana bread, but I knew that it would make an awesome ice cream too, and I was right. The white chocolate panna cotta was really soft and acted as like a dipping sauce. I really like the way the peach and cumin flavor came together with the banana bread and white chocolate. There is a little sprinkle of sechyaun pepper made to be enjoyed sparingly with the dish. When I came into work today I had little trouble figuring out what I wanted to make for the soup. I must have stood in the fridge for at least 10 minutes and I still did not have a clue what to make. Then I turned around to leace and I saw the mushroom cabinet. I opened it up and saw some beautiful oyster mushrooms that are from a local farmer. Since I have already made hot and sour soup, and drunken shiitake soup I wanted to go a little different.. Then it dawned on me that I have had a pho recently that was just wonderful. The plate above is what is presented to the guest and then the steaming hot broth is poured in the center. There are two things that pho and shabu shabu have in common. The first is the really hot broth and the second is that the hot broth is there to cook rare or raw meat. The differnce is that pho has the meat placed in it at the last second and shabu shabu is on the side and dipped one at a time by the guest. There are actually entire restaurants devoted to this practice using everything from beef to vegetables. Besides the bouillabase that I made I also had to make a soup. We had these local grown sweet potatoes (the same ones that I used for the ruille in the bouillabase). I wanted to use vanilla but I did not want the flavor to be too strong and I also wanted to cut the thick starchyness of the soup, so I lightly pickled the peaches in a vanill broth. The rest you can take for yourself. I really like the flavor of the dish a lot. It really had everything that I like in the dish, vinegar, spice, seafood, salty (maldon sea salt), acidic (tom. gelee). I am really happy with every aspect of the dish and I hope you are too! The way that this dish came to my mind is a thought process from a dish that my chef had at Per Se. When she ate there the night before the James Beard Awards this year, she had a dish that was a thin sheet of dark chocolate on a glass and inside was olive oil sorbet. The server came and poured some Armando Manni olive oil over the top and the chocolate melted over the sorbet. She said this is one of the most memorable dish that has had. Besides being inspired by Per Se and Jonathon Benno but the presentation is inspired by Charlie Trotter. Well I did not use dark chocolate but the flavor of the asiago and white chocolate with a little Maldon sea salt was great. I am really gonna have to make some ice cream with this combo soon. The sweetness of the raw scallop went great with the white chocolate and the bitterness of the olives and oil. This dish was not perfect but I did learn a lot and will use the things I learned again. The flavor progression im my mind can only be explained not really reasoned. I started off with the beet and anise sorbet. Then it was from beet to gorgonzola, okay a natural progression maybe but I am trying to make a dessert. So I thought how to make the gorgonzola light and not over powering. That is where merengue came in to play. Then there is the problem that gorgonzola is a cheese which is full of fat and egg whites have trouble whipping in the presence of a lipid. So know I have a new problem. I made a gorgonzola stock, gelled it , froze it, hung it. The next day I made a gorg. simple syrup and the end result was a merenge that whipped to medium peaks and had an aroma of bleu cheese and very light flavor. Okay you may be wondering now how did I get to ancho and cacao. Well the sorbet is sweet with a touch of vinegar and with the rich merengue I thought that the dish needed something bitter so like usual I went to the extreme with bitter 75% coveture, Bully Porter, and Ancho peppers. All of these things are very bitter. So I dont know if you understand the explanation of the progression of this dish but if it was confusing the same mind that came up with it is also trying to explain it. Tonight I was on the pastry station. If you wonder why, several months ago I told my chef that I was interested in learning pastry because I wanted to be rounded in the whole kitchen. I asked my Pastry Chef if it was cool if I did the amuse and he was totally cool like always and told me to do what ever I wanted (That means he was ready to see whatever I pulled out). Well of course I had been thinking all day about what was in the kitchen and what I could make out of it. Besides this amuse I made a beet and anise seed sorbet but it was not frozen enough by service to spin for plating. I really like the richness of the panna cotta with the acidic cutting of the fat from the agridulce (spanich term for sweet and sour). The fresh chervil (I dont think that you guys know how much I love frest herbs) added this clean refreshing feeling that the dish needed. I added these awesome flowers from chef gardens that have a wonderful citrus flavor and a great long corriander flavor that matched the dish perfectly. I had the servers pour the flower and lobster broth at the table and the aroma of the flower engulfes the guests. Really liked the blog and great dishes, I really got to move to chicago where creativity is encouraged. Again great and interesting ideas. I definitely found some unique information from this. It’s great that you used your time to do all this. I repeatedly discover myself spending way too much time either reading and/or commenting. Absolutely worth the time, regardless.